Heather O'Donnell has made a special study of the piano music of Charles Ives and provided Musical Pointers with an essay which is reproduced here. 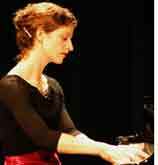 Follow this link for more about her, and a review of Philip Mead's recording of the sonatas on METIER MSV CD92037. The pianist William Masselos described the music of Ives as a "fabulous archaeological site, a sacred (or not-so-sacred) capital buried (or half-buried) in lava, jungle, or sand." This description is particularly poignant in regard to the "Concord Sonata", a work with countless levels of understanding, revelation, and discovery. The first-time listener may experience the bedazzlement, energy, attraction, and force of the piece. The listener who has lived with the piece over some time may perceive the brilliance of its construction, the coherency of its thought and impulse, while marveling at its precocity and innovation. These notes are intended to aid the first-time listener; the listener entering into the world of Charles Ives, and hence the worlds intrinsically bound with Ives - New England in the late nineteenth-century and American Transcendentalism. The composer considers his second Piano Sonata to be "an attempt to present [one person's] impression of the spirit of transcendentalism that is associated in the minds of many with Concord, Mass. This is undertaken in impressionistic pictures of Emerson and Thoreau, a sketch of the Alcotts, and a Scherzo supposed to reflect a lighter quality which is often found in the fantastic side of Hawthorne." Ives composed the Sonata from 1911-1915, though he continued to revise the piece well into the 1920's. He composed much of the piece in a natural setting, his country home in West Redding, CT (a much needed haven from the taxing work days in Manhattan as the co-founder of one of America's leading Insurance Companies). Nature plays a crucial role in the outer movements of the Sonata. Ives describes Emerson shouting from the mountaintops, and Thoreau silently internalizing his woodlands and pond. By contrast, the inner two movements are concerned with human activity. Hawthorne's fascination for describing phantasmagoric pictures of the life in New England towns, and Louisa May Alcott's depiction of the life inside the home. These very diverse subjects are musically unified through a web of themes that are present in each of the movements; most recognizably and relentlessly- the opening notes from Beethoven's Fifth Symphony. He treats these themes in remarkably different ways, molding them to the impression he is creating of each author. Ives begins his Sonata with an explosion. He depicts Emerson as an almost mythic character, hurling thunderbolts of truth from the mountaintop. In this movement, Ives presents his most radical musical expression, showing Emerson as a spiritual pioneer in unknown territory. His musical ideas mirror Emerson's method of discourse- he presents a mass of material for the listener to grapple with, not wishing to clarify or organize the thoughts too neatly, for "a clearer scoring might lower the thought". Ives spends much of the movement depicting Emerson's prose with jagged edges, abrupt contrasts, overlapping material; occasionally he enjoys Emerson's poetry with rhapsodic, melodious and effusive music. The second movement, Hawthorne, provides a bit of comic relief. In his Essays, Ives stresses that he is not concerned with Hawthorne's penchant for moralizing, but only with his fantastic side, and his ability for painting written images of American life in the mid-nineteenth century. "Hawthorne" is a dream-sequence full of colorful impressions of the "everyday"; as Ives says: "a take-off of things funny, fairylike, wild, real and unreal". He goes on to describe a boy waking on a frosty Berkshire morning, going riding on a railroad, suddenly dropped off in an old churchyard hearing solemn hymns that are rudely interrupted by a passing marching band, then back on the railroad again. The Beethoven theme opens the third movement, the Alcotts, in a statement of gentility, sincerity, and hope. Ives indicates that the soul of transcendentalism is as much in the quiet simplicity of the Alcott home, as in the heroic and ponderous thinking of Emerson and Thoreau. The most personal and transcendent music is saved for the finale. Ives considered Thoreau a personal friend, one that had comforted him during the devastating period following the premature death of his father. In this movement, the personal and universal are interwoven in an unforgettable way. It begins with depictions of the sounds from Nature that Thoreau may have heard during his stay at Walden Pond. When Thoreau "enters" this environment, the harmony of Nature is unbalanced by the human presence. Thoreau is hindered from joining the rhythm of Nature by his human strivings and concerns. Nature, as forceful as she is benignant, eventually overcomes Thoreau and he joins her on this journey of a day. In the evening Thoreau plays his flute over Walden Pond. Night falls as the music stretches upward towards the firmament, leaving the specific to rejoin the universal. 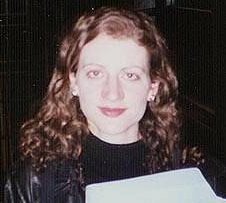 Seen&Heard congratulates Heather O'Donnell upon receiving first prize in the soloists category at the 5th Krzysztof Penderecki International Competition of Contemporary Chamber Music, Krakow, October 2001 and also being awarded the special prize for best performance of a work by a Dutch composer, funded by the Gaudeamus Foundation.